Ich habe mich eingetragen in Shimelles Christmas Journal Class – die Idee wÃƒÆ’Ã‚Â¤hrend der Vorweihnachtszeit 15 Minuten fÃƒÆ’Ã‚Â¼r sich selbst zu nehmen und Weihnachten zu reflektieren hat mich sehr gereizt. I signed in to Shimelle‘s Christmas Journal Class – the idea of taking 15 minutes each day for myself and reflect christmas has really attracted me. Heute also das unfertige Cover and mein Manifest – somit der erste Eintrag. Today the unfinshed cover and my manifesto – the first entry. Manifesto: Noun. A declaration of one’s intentions. 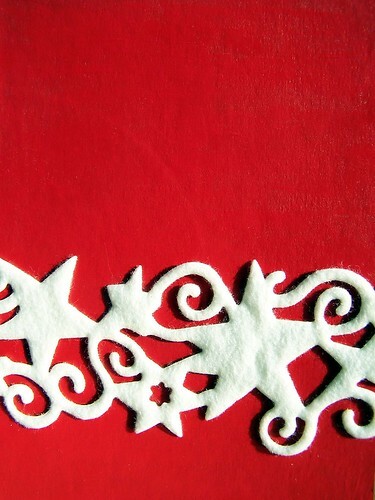 Starting December first, I will keep a Christmas journal. 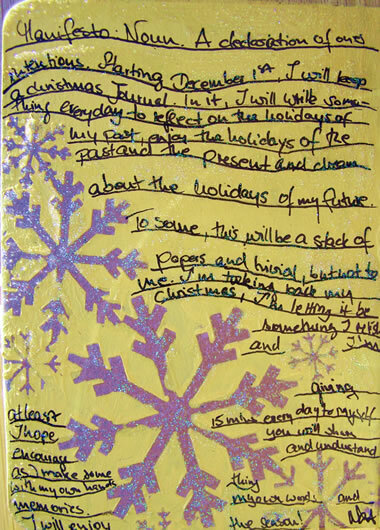 In it, I will write something every day to reflect on the holidays of my past, enjoy the holidays of the present and dream about the holidays of my future. To some, this will be a stack of papers and trivial scribbles, but not to me. I am taking back my Christmas, I am letting it be something I relish and, most importantly, I am giving at least fifteen minutes every day to myself no matter how crazy this season becomes. I hope you will share, encourage and understand as I make something with my own hands, my own words and my own memories. I may post some or all of my entries here. Other artists are doing this with me, and you can see their work at Writtendown Or you join us. Above all: enjoy the season. I will. Eine tolle Idee – ich freu mich auf deine Seiten! Bis jetzt sieht es super weihnachtlich aus…klasse! Der Filz sieht fantastisch aus! Love to see one of your pages each day! wow! super schÃƒÆ’Ã‚Â¶n! ich bin schon sehr auf das fertige cover gespannt.